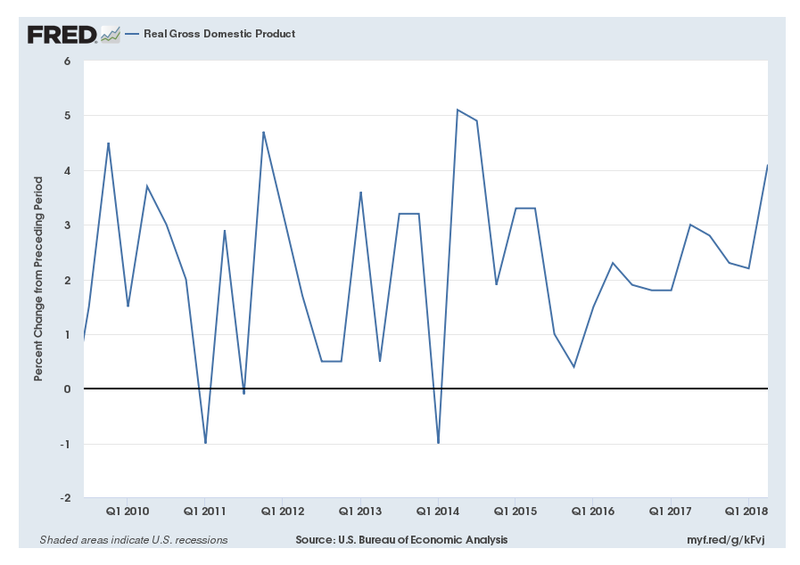 In Friday's report on real GDP growth in the second quarter, the BEA reported a quarterly growth rate of 4.1%, which exceeds both the post-WWII US average growth rate of about 3%, and the average growth rate since the end of the last recession of about 2.2%. 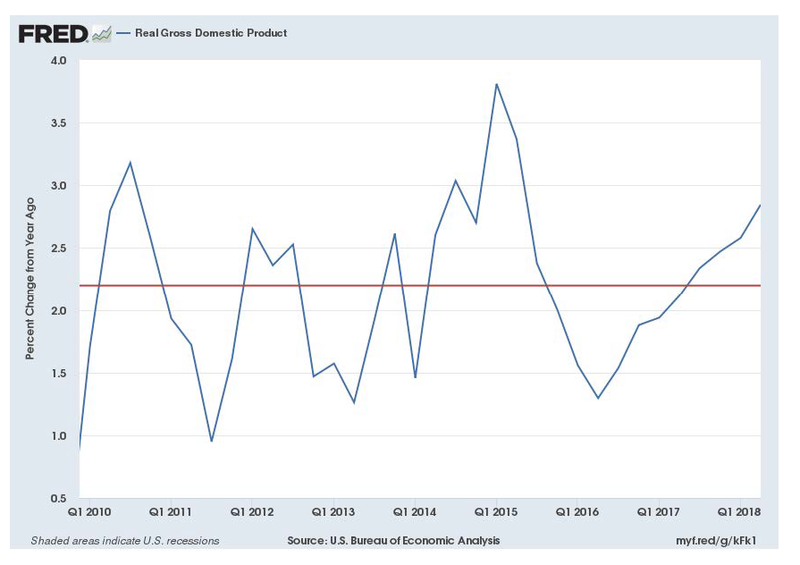 Trump seems to be claiming that recent GDP performance has been better than it was, and is hoping for future growth of 3% or more in real GDP. This seems more modest than his early 2017 claim that growth would proceed at 4% or more. What should we make of this? It's always useful in these circumstances to remind yourself what is being reported. GDP is a flow - output per unit time - but the BEA reports a number which is seasonally adjusted at annual rates. That is, it's reported as if the seasonally adjusted flow had continued for a year, instead of just for a quarter. 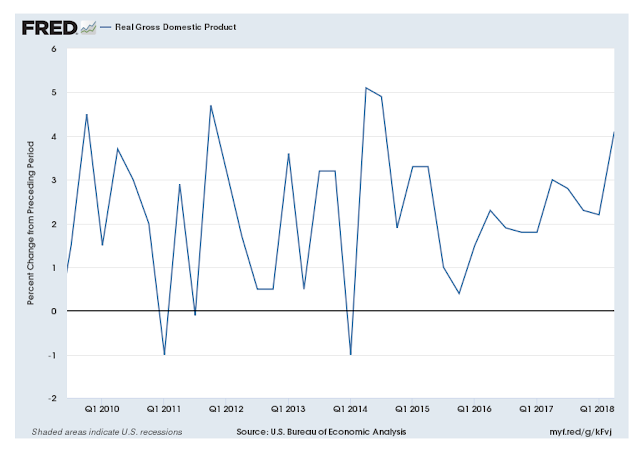 So, what we're supposed to get excited about is that real GDP for the second quarter is measured to be about 1% higher (seasonally adjusted) than it was in the first quarter. The average quarterly growth rate since the end of the last recession has been 0.55%, so we got an extra 0.45 percentage points in growth relative to the recent average, which might not seem so exciting. The noise is obvious, I think. Over the last 36 quarters, growth rates have exceeded 4% on five occasions. With one observation exceeding 4% in his 6 quarters in office, Trump is doing about average in post-recession excess-of-4% terms. Current year-over-year growth is 2.8%, which exceeds the post-recession average of 2.2%, but 2.8% isn't unusual in the second chart. 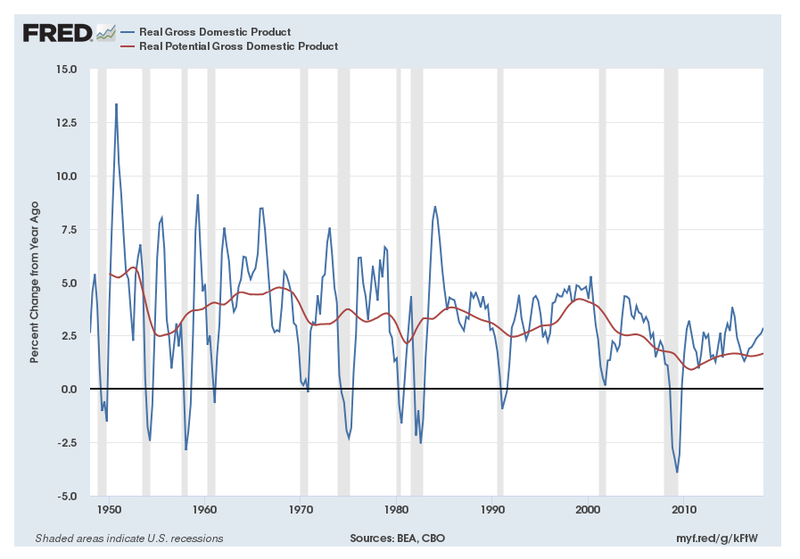 So, real GDP is a little above trend, but there's nothing in the behavior of the time series to indicate a sustained upside departure from the 2.2% trend. 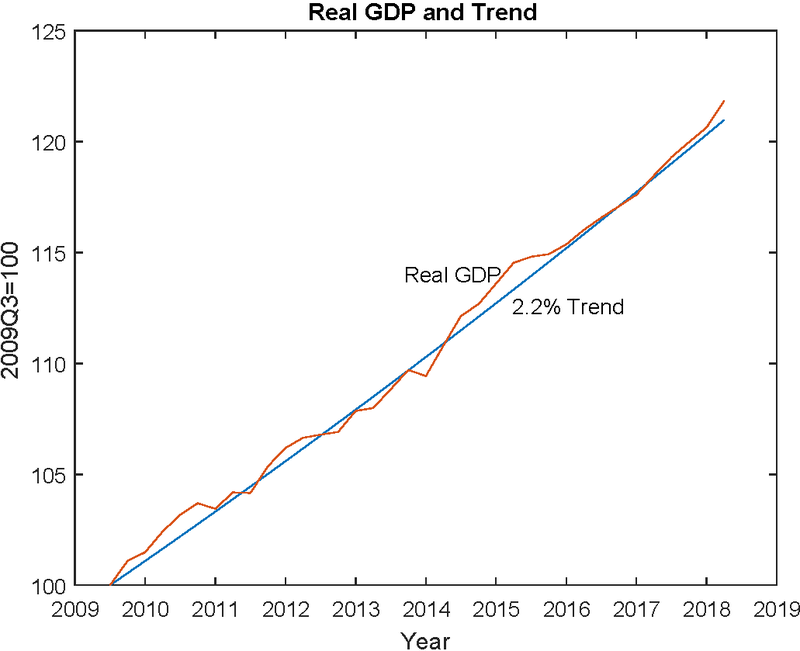 Potential gross domestic product (GDP) is defined in the OECD’s Economic Outlook publication as the level of output that an economy can produce at a constant inflation rate. 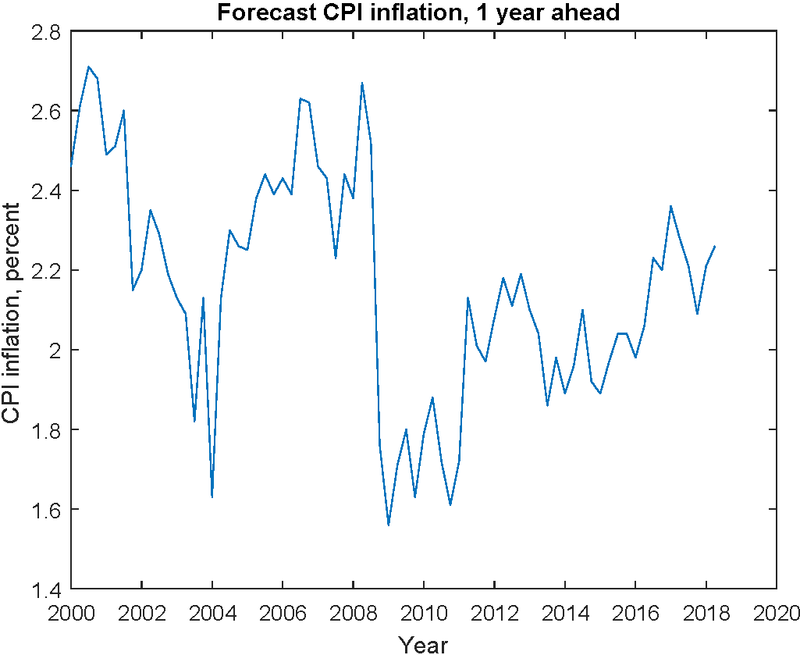 Although an economy can temporarily produce more than its potential level of output, that comes at the cost of rising inflation. 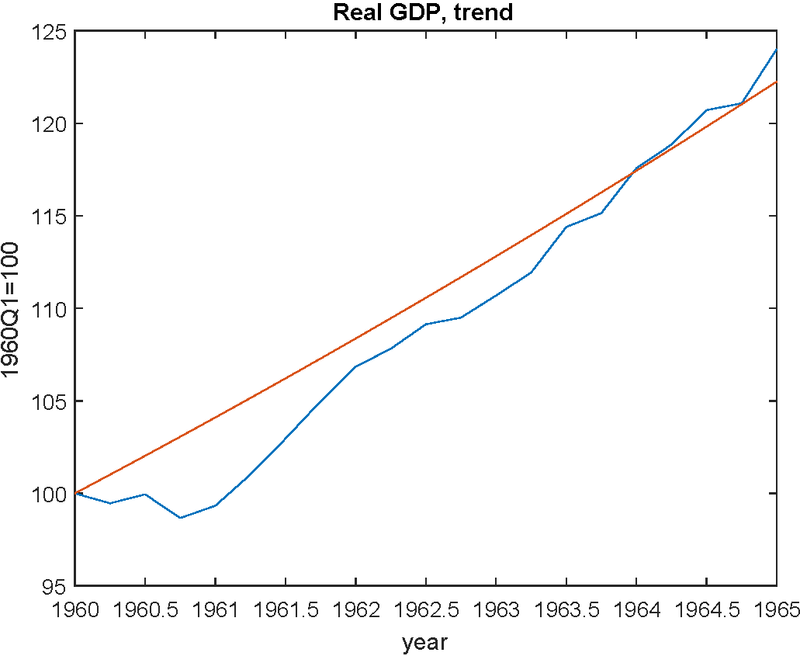 Potential output depends on the capital stock, the potential labour force (which depends on demographic factors and on participation rates), the non-accelerating inflation rate of unemployment (NAIRU), and the level of labour efficiency. Whatever good reputation the OECD has, it didn't earn it by writing definitions, apparently. 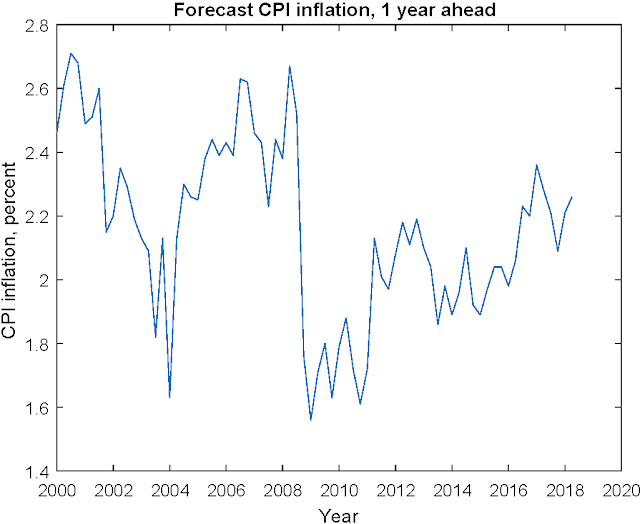 The OECD says that, if inflation is constant for an unspecified period of time, then we're observing potential output, whether the inflation rate is 5,000% per annum or 2%. That can't be right. Dish out that advice in 2007, and by 2012 people are laughing at you. 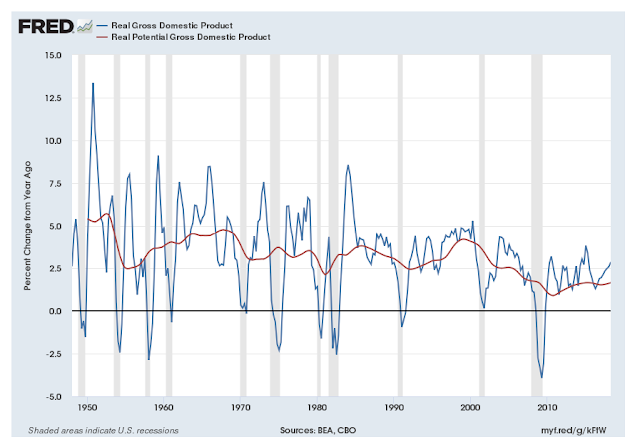 Potential GDP measures, such as the CBO's potential GDP measures, aren't so different from that, and the CBO made errors on the order of what is in the last chart in forecasting the recovery from the recession. The CBO's approach to long-term forecasting is more or less consistent with what conventional models of economic growth predict. 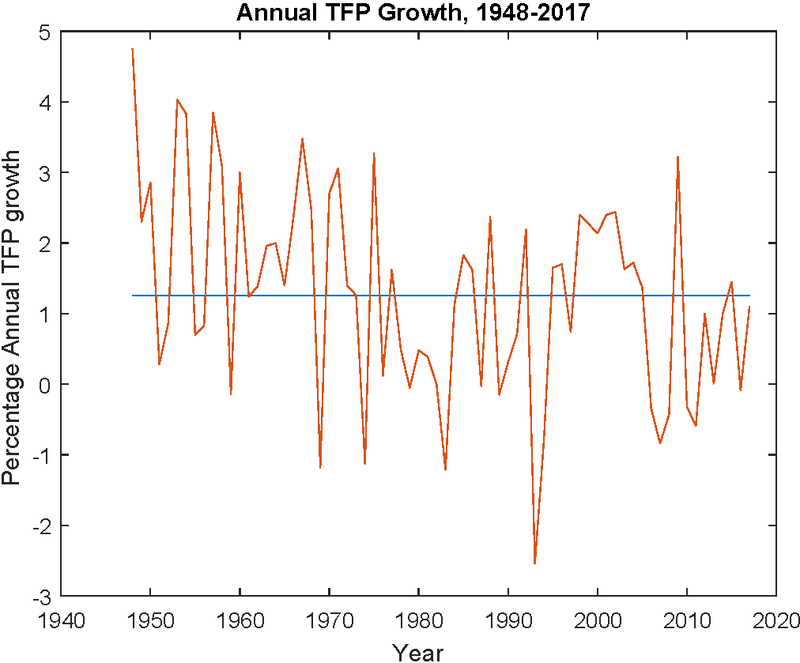 In a neoclassical growth model with exogenous labor force growth, exogenous total factor productivity (TFP) growth, and constant returns to scale, the economy converges to a steady state in which output grows at the TFP growth rate plus the growth rate in the labor force. So, the CBO makes long-run forecasts based on an assumption about the aggregate production function, and projections for TFP growth and labor force growth. Here's actual year-over-year real GDP growth, and year-over-year growth in the current CBO potential GDP measure. Currently the CBO potential year-over-year growth rate is 1.9%, and the potential growth rate is lower than actual growth has been, on average, as the CBO does not think that 2.2% growth can be sustained. Presumably that's mainly because unemployment has been falling as employment has been growing, since the end of the recession. 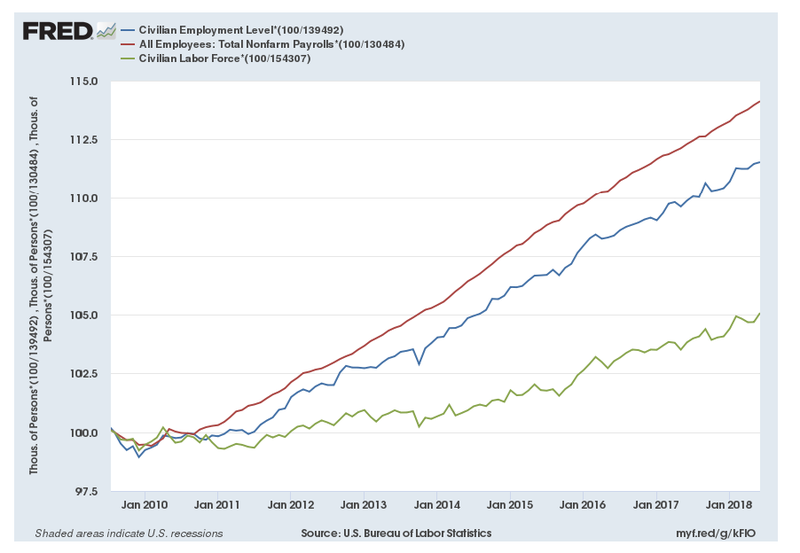 Employment growth is ultimately bounded by growth in the labor force (employment plus unemployment), and labor force growth in turn is bounded by growth in the working age population. Recently, labor force growth has increased somewhat to around 1%, while working-age population growth (no idea exactly how these numbers are constructed - growth rates look a little odd) has been on a secular decline and is currently in the neighborhood of 0.5%. That's somewhat depressing. Since the recession, TFP growth has mostly been lower than the post-WWII average growth rate of 1.3%. The average since the last recession is 0.3%. So, the most pessimistic scenario is that TFP continues to grow at 0.3% per year, employment grows at the working-age population growth rate of 0.5%, and we get sustained growth of 0.8% per year in real GDP. 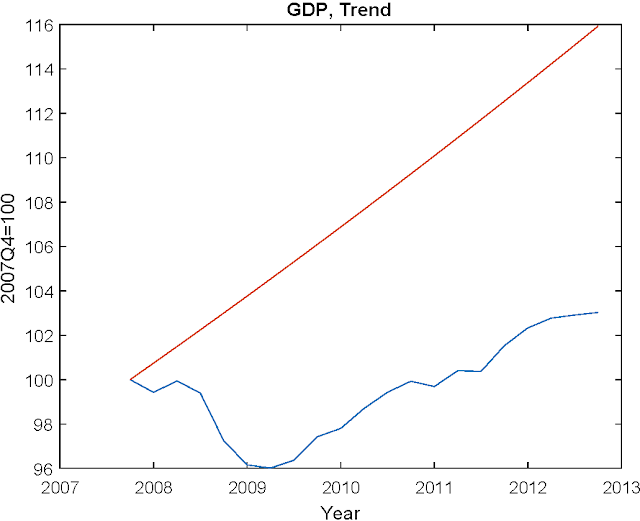 TFP growth, as we know from growth economics, is key though. Higher TFP growth means higher growth in real wages, which means higher growth in the labor force (labor supply effect - provided the substitution effect is large on the extensive and intensive margins). 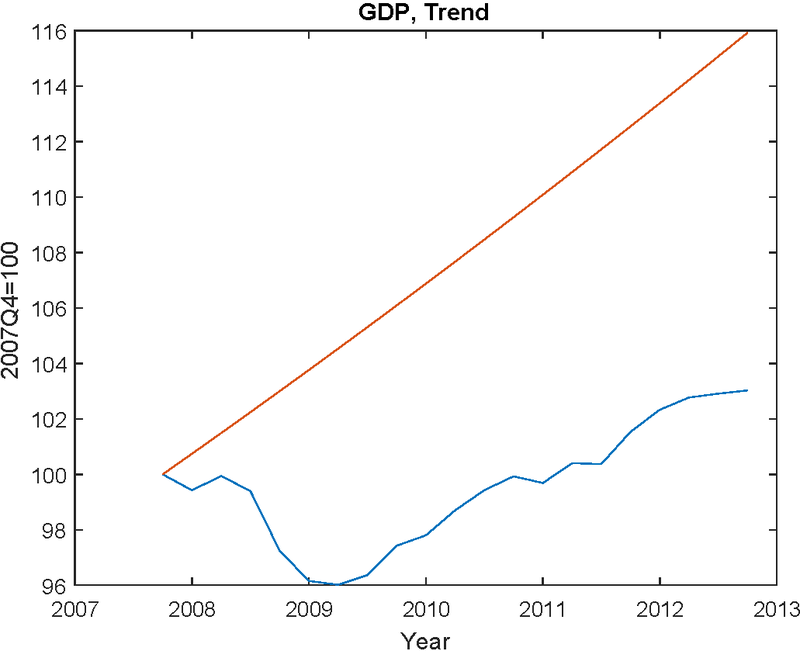 And then higher TFP growth and higher labor force growth both contribute to output growth. 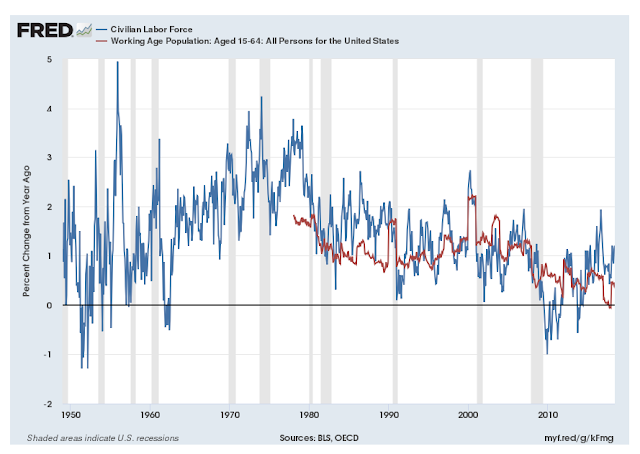 But, optimistically, supposing TFP grows at 1% (just short of the post-WWII average) and the labor force grows at 1%, that only gives us 2% growth in real GDP. To get to 3% or, more outlandishly, 4%, requires a serious miracle. So, where could a miracle come from? Well, people are always inventing things, and the miracle could be the implementation of a new technology. There's plenty of debate about this, indicating that economists aren't much better at predicting technological innovations five or ten years hence than your average person. Are we going to get a government-induced economic miracle? From the current US government, that would be another kind of miracle altogether. Some people think that regulation is a big deal - excessive regulation leads to inefficiency and lowers TFP. But regulation can cut both ways. Remember the financial crisis? If we unwind financial regulation that was introduced to prevent crises, that of course won't help the average rate of economic growth. Some people think that taxation is a big deal. The US tax code could in principle be redesigned to collect the same amount of revenue in a far more efficient way, potentially increasing TFP and the size of the labor force. But it's hard to argue the the tax changes recently passed by Congress would do much in this respect. Further, tariffs are indeed taxes, and the way these ones work isn't going to grease the wheels of the US economy. Governments can potentially increase productivity through policies related to public education. But apparently the US Secretary of Education thinks public education is a waste of resources. Governments can provide public infrastructure that makes the private sector more productive. Haven't seen much of that. Donald Trump likes to spend on the military and keeping people out of the country, neither of which is going to contribute to measured GDP. It would be nice to be more optimistic, but it looks like what you see is what you get. The deputy manager followed with a discussion of money markets and open market operations. 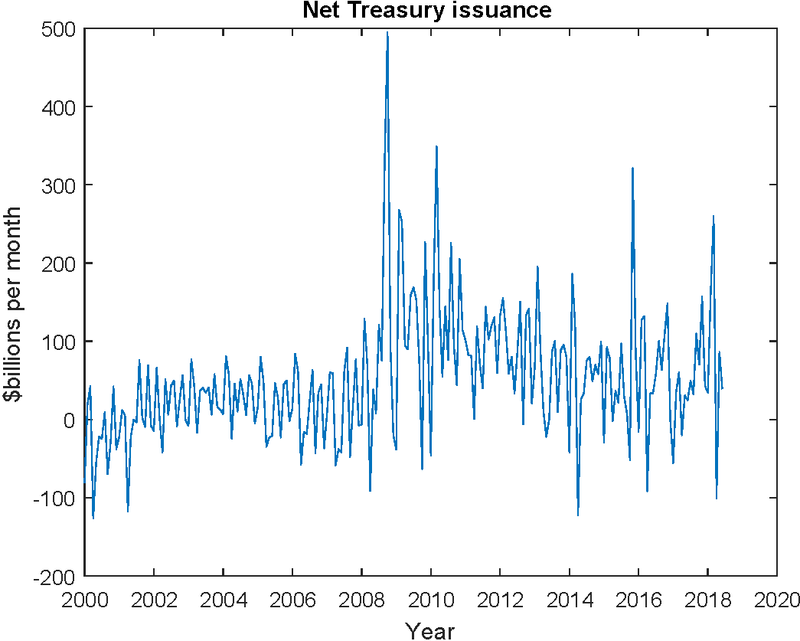 Rates on Treasury repurchase agreements (repo) had remained elevated in recent weeks, apparently responding, in part, to increased Treasury issuance over recent months. 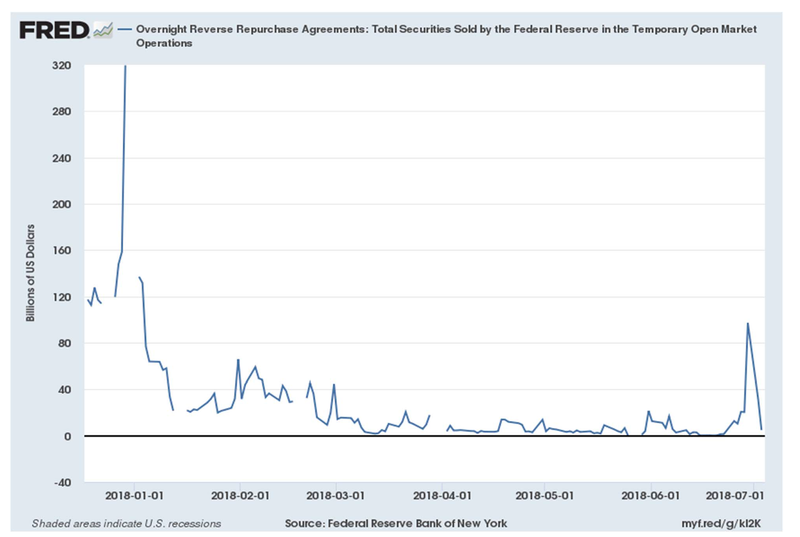 In light of the firmness in repo rates, the volume of operations conducted through the Federal Reserve's overnight reverse repurchase agreement facility remained low. Elevated repo rates may also have contributed to some upward pressure on the effective federal funds rate in recent weeks as lenders in that market shifted some of their investments to earn higher rates available in repo markets. First, it seems a good sign that the Fed is paying attention to Treasury debt management. After all, the large asset purchase programs the Fed engaged in from late 2008 to late 2014 were a form of debt management. The Fed conducted assets swaps of short-maturity reserves for long-maturity Treasuries and mortgage backed securities, and swaps of shorter-maturity Treasuries in its portfolio for long-maturity assets. In so doing, the Fed wanted to change relative asset supplies at different maturities with the purpose of altering the term structure of interest rates - basically, flattening in the yield curve. Or, that was the theory, at least. But in conducting its quantitative easing (QE) programs, the Fed appeared to be paying no attention to what the Treasury was doing. 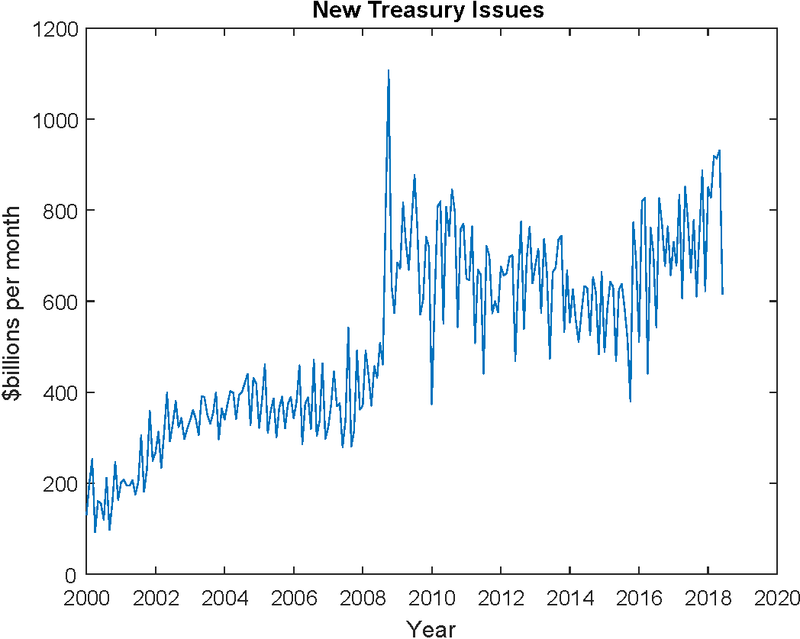 That's somewhat disturbing, as one of the Treasury's jobs is to manage the government debt - to decide when to issue debt, how much to issue, and what maturities to issue. If the Fed wants to manage the government debt, maybe it should be coordinating with the Treasury, or maybe it should ask Congress to add debt management to the Fed's job description. 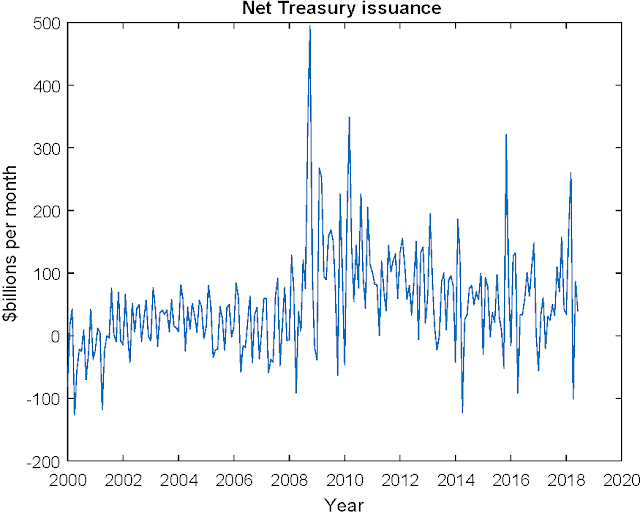 So, indeed, average issuance over the last six months took a jump of about $100 billion per month early this year, relative to last year. 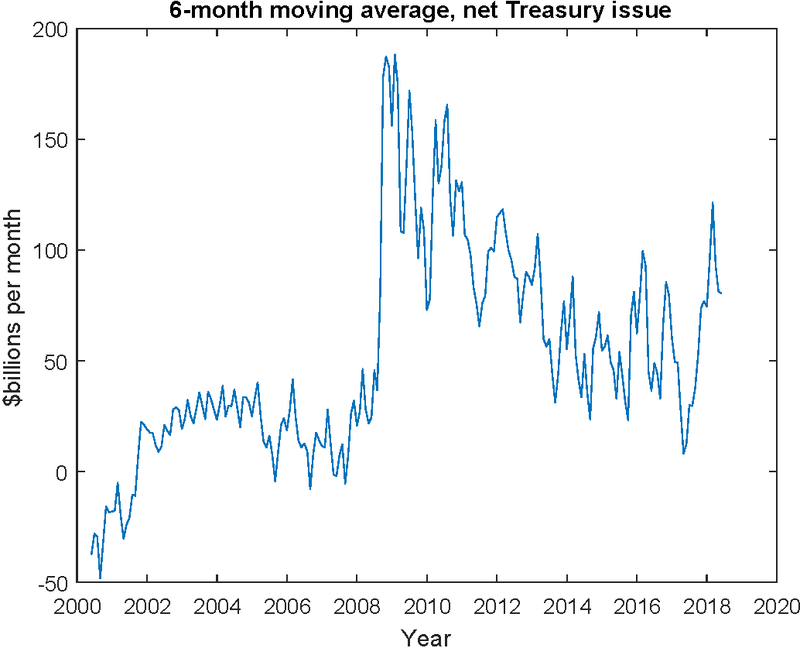 If you thought about that in the context of a reduction in the Fed's uptake of Treasuries and close substitutes, with the reduction in that monthly uptake currently capped at $30 billion, then it might seem like the Treasury's activities are more important. In my last post, I was blaming the cessation of the Fed's reinvestment program for the tightening up of overnight interest rates. That is, all overnight interest rates - repo rates, the fed funds rate - are close to the interest rate on reserves (IOER) currently, and that's a new phenomenon. In the quote above, it looks like the SOMA people are blaming the Treasury for this. A bit of an odd tactic that, as one might think the Fed would take the blame when their floor system starts to work the way it should. That spikes up in the first part of this year, but it was also way down in the last part of last year. Also, note the quantities here. The cap on the value of securities in its portfolio the Fed will allow to mature is currently $30 billion, and that will increase to $40 billion in July, and finally $50 billion. 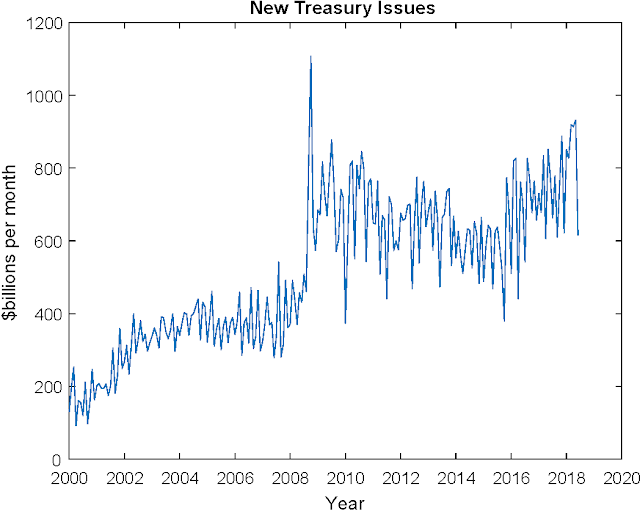 The net flow of new Treasuries has averaged about $60 billion since 2014, so $30-$50 billion is large relative to that and, I think, consistent with the idea that it's the Fed's non-reinvestment policy that's mitigating a scarcity of safe collateral in the repo market. We have to account for mortgage-backed securities in the calculation, but I don't think that changes the story. There have been some interesting developments in US financial markets over the last few months, that I think have an important bearing on how we should be thinking about large central bank balance sheets, quantitative easing, and the choice between floor systems and corridor systems for central banks. To really do a good job on this issue, one needs to know monetary economics, financial economics, and the intricacies of institutional details and regulation in overnight markets, but I'll do the best I can, and maybe some people can help fill in the spaces. This post is a bit on the long side. If you want the executive summary, here goes. 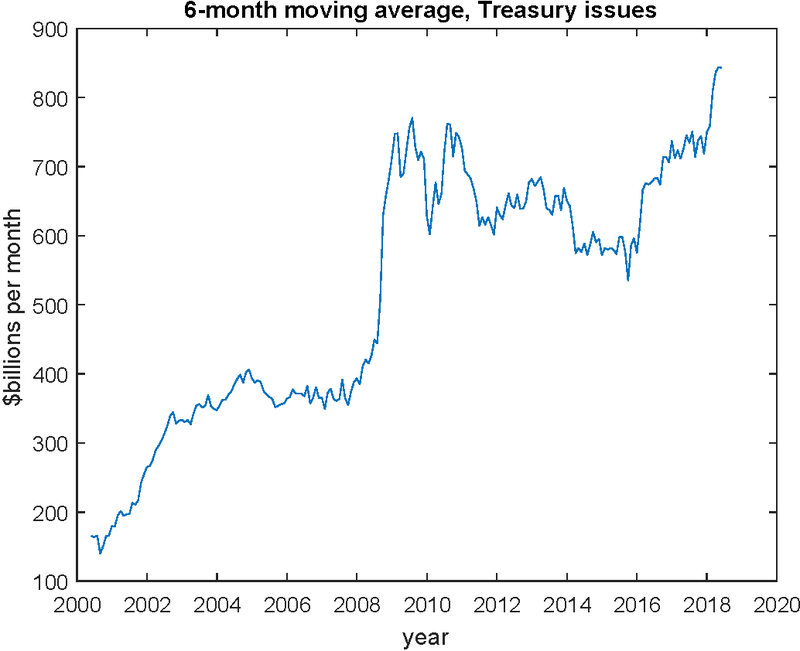 Recently, overnight financial markets have tightened up considerably, in the sense that the interest rate on excess reserves (IOER) is close to all overnight interest rates. The floor system of central bank intervention that the Fed designed, before interest rates went up in late 2015, is now working as floor systems should. Why are things working better? Because the Fed is finally phasing out its big-balance-sheet program, which was hindering the functioning of overnight markets. The FOMC has not seen the light yet, though. They love QE, and seem to be on a road to permanent big-balance-sheet. 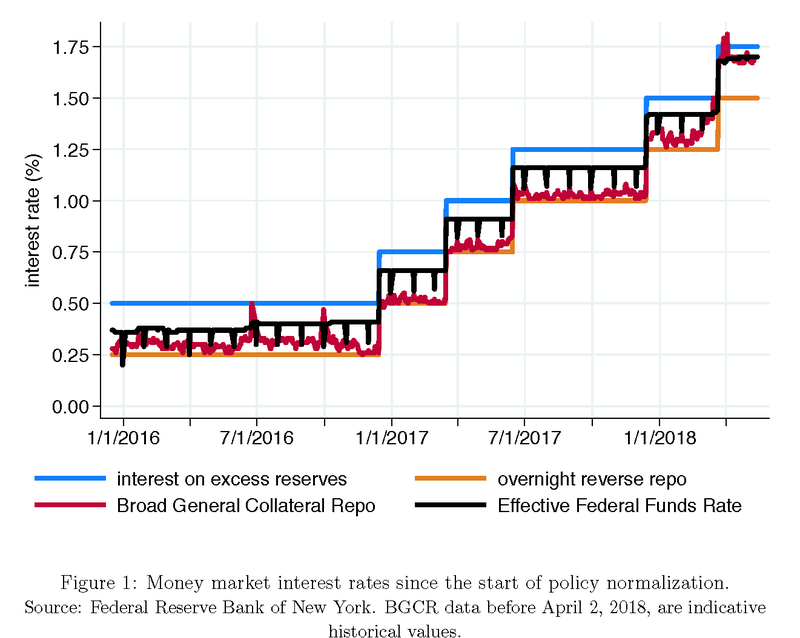 The more-than-five-fold nominal increase in the Fed's securities holdings, along with near-zero nominal interest rates, was viewed by the FOMC as an emergency policy, which it would ultimately exit from - in some fashion. Well apparently that emergency lasted a very long time. The Fed did not begin increasing its target range for the fed funds rate until late 2015 - seven years after the financial crisis. And the reinvestment policy which held the nominal stock of the Fed securities constant was kept in place until October 2017. At that date, the Fed implemented a modest plan to reduce the size of the balance sheet through a phaseout in the reinvestment program. That is, there would be caps on the quantity of securities the FOMC would allow to mature without replacment, with the caps set to rise from $10 billion in October 2017 to $50 billion in October 2018. A $50 billion cap would bind infrequently given the current size of the Fed's portfolio, and would stop binding entirely as the size of the portfolio falls. 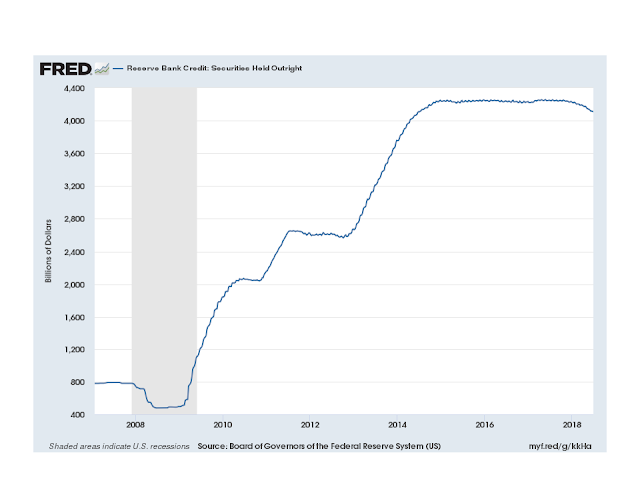 As you can see from the chart, the balance sheet reduction program has become visible, but it will still take years for the balance sheet to fall to the point where it looks like pre-financial-crisis days, i.e. 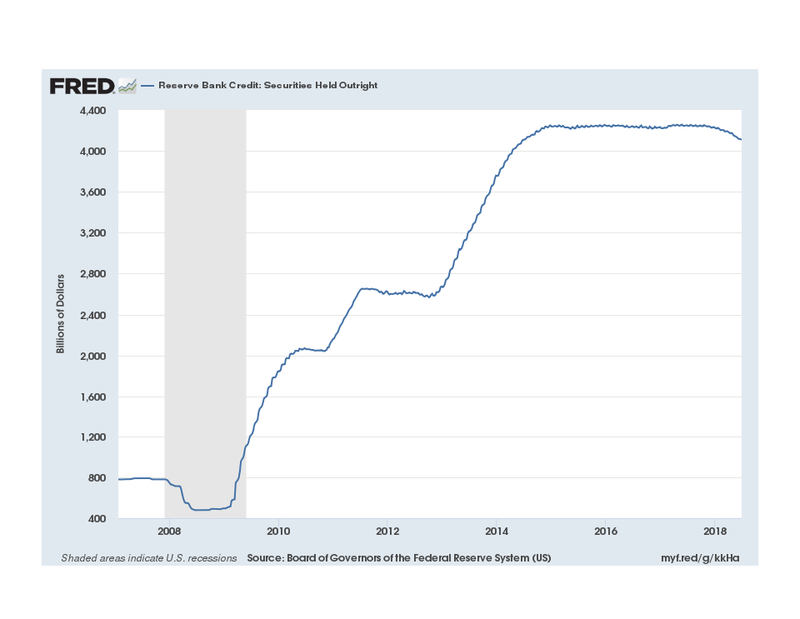 excess reserves close to zero. 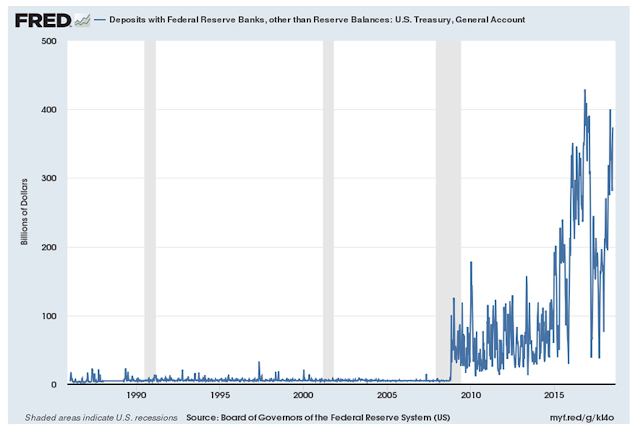 But that gets us to the liabilities side of the Fed's balance sheet, which is actually where the action is, particularly in terms of this post. Before "liftoff" happened in October 2014, I wrote about how the implementation was supposed to work, in a large-balance-sheet world. The FOMC was uncertain about how liftoff would work, as they had never done anything like this before, and some idiosyncratic features of US financial markets made liftoff a tricky business. In theory, a floor system - when there are excess reserves outstanding in the financial system - should work in a very straightforward way. The Bank of Canada did this for a year-long period from Spring 2009 to Spring 2010, with no problems. In a floor system, the central bank sets IOER, and arbitrage in the overnight market should more-or-less equate all safe overnight interest rates to IOER. But, in the US, some ill-informed people in Congress wrote the amendment to the Federal Reserve Act authorizing payment of interest on reserves in such a way as to deny government sponsored enterprises (GSEs) - including Fannie Mae, Freddie Mac, and the Federal Home Loan Banks - interest on reserves. So, every day GSEs are looking for a place to park their overnight funds to earn some interest, rather than having these balances sit in reserve accounts earning zero. Over time, the arrangement that developed was for the GSEs to lend overnight on the fed funds market to whoever would give them the best price. Fannie Mae and Freddie Mac apparently dropped out of that game, leaving a fed funds market dominated by arbitrage trading between Federal Home Loan Banks, as lenders, and branches of foreign banks in the US, as borrowers. Why foreign banks? Because they had the lowest costs. This arbitrage was subject to frictions, thought to be "balance sheet costs." For example, a commercial bank that borrowed on the fed funds market and put those funds in its reserve account would have higher assets, and would therefore pay a higher deposit insurance premium, or would have to worry about satisfying capital requirements or other regulatory constraints. A foreign bank in the US has no retail deposit business, and thus is not paying a deposit insurance premium, implying lower costs of borrowing fed funds. When liftoff occurred, the big concern was whether the fed funds rate would actually go up when IOER went up. In the immediate pre-liftoff period, the effective fed funds rate was typically in the range of .05-.15%. The IOER/fed funds rate differential of 10-20 basis points was thought to reflect balance sheet costs. But, would this differential persist, would it decrease, or would it increase? That uncertainty caused the Fed to buy insurance, in the form of the overnight reverse repurchase agreement (ON RRP) program. Every day, the Fed conducts a fixed-rate full-allotment program under which specified counterparties lend to the Fed, mainly overnight, with the lending secured by securities in the Fed's portfolio. Until recently, the ON-RRP rate was fixed at 25 basis points below IOER, the idea being that this puts a floor under the floor in the Fed's floor system - a subfloor, as it were. If you think that's unusual, you would be right. So, what has been happening in overnight markets since December 2015? First IOER has been increased seven times. The first six were 25-basis point increases, and the last increase was 20 basis points, to 1.95% on June 15. 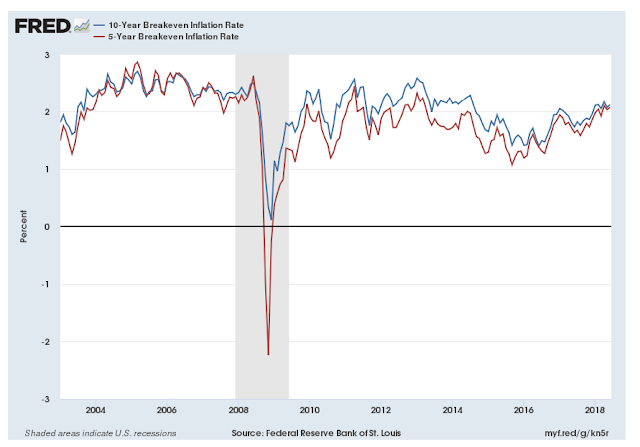 A key feature in the last chart is that, initially, the IOER/fed funds rate differential was 10 to 13 basis points, but that shrunk to about 9 basis points, and stayed at roughly that level through the period when IOER was 1.5%, but since the March 22 hike, the differential fell to 5 basis points and then to 3-5 basis points after the June 15 increase. 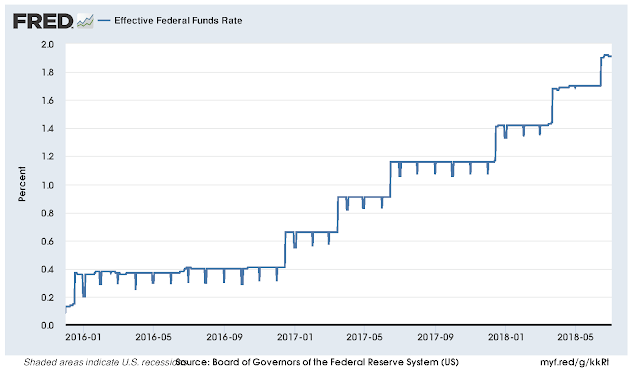 The fed funds rate is currently at 1.91%, with IOER at 1.95%. Further, note that the downward spikes in the fed funds rate that occurred at every month-end have disappeared. The spikes were presumably due to accounting reasons. Borrowers in the fed funds markets wanted to fix up their balance sheets for month-end, and lenders had to find other places to park their funds overnight - I'm assuming in the repo market, at lower rates. We can get more detail on the fed funds market from the New York Fed. The effective fed funds rate is an average (which only included brokered trades in the past, but I'm not sure what the coverage is now). 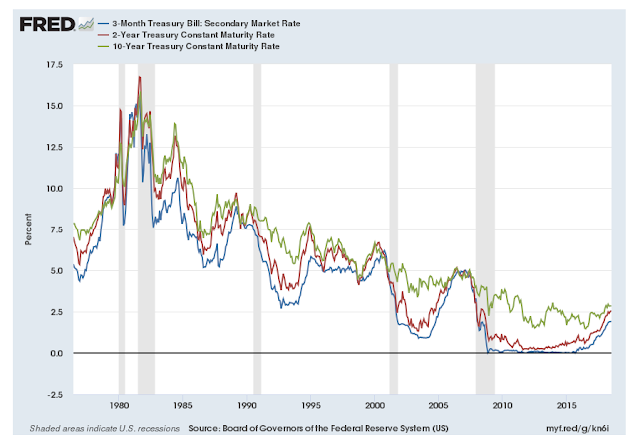 There is always dispersion in interest rates in the market, and dispersion can get high when there is significant counterparty risk, as happened in the financial crisis. As you can see in the table, focusing on the last trading day listed, July 2, most of the trades are close to the mean. The effective fed funds rate was 1.91%, and 50% of the trades were within one basis point, plus or minus. But the 99th percentile was 2.06%, i.e. 15 basis points above the mean, which is substantial. That's also 11 points above IOER. 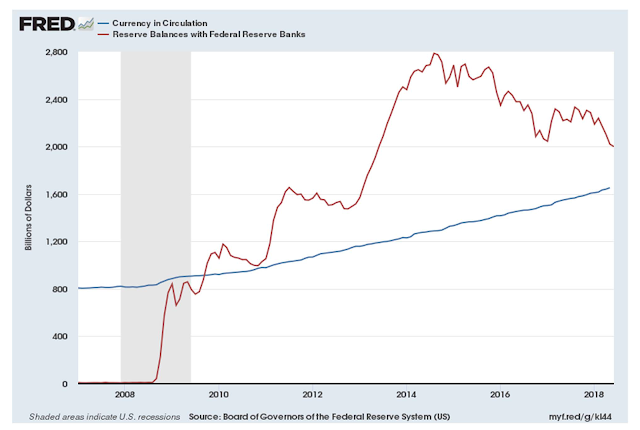 What's going on here is that, in a system still flush with reserves, most trading on the fed funds market is between GSEs and banks that can earn interest on reserves. But there are still some banks that need to borrow overnight to meet a reserve requirement, for example. A bank might have to make a large payment late in the day, find itself short, have to scramble to find a lender, and end up paying a premium above IOER. Also, here's the volume of daily trade on the fed funds market. 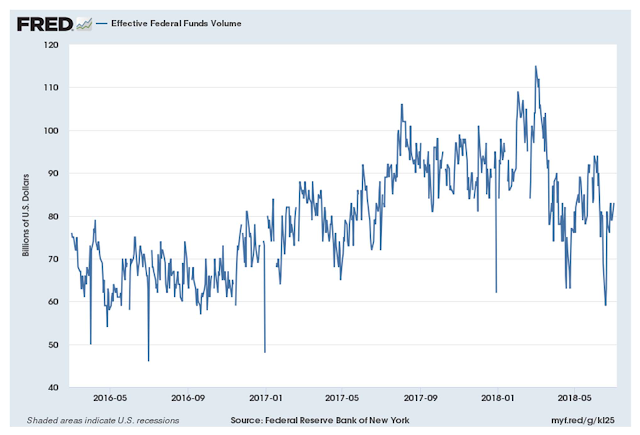 Volume is lower than before the financial crisis (as, again, the system is flush with reserves), and somewhat lower than late last year or early this year, but about the same as a year ago. Though fed funds are trading close to the top of FOMC range, which is currently 1.75-1.95, the tightening in the differential between the IOER and the fed funds rate isn't associated with markedly different trading volume in the fed funds market. What's been happening with the Fed's ON-RRP facility? That's just since the end of 2017, but it shows the volume of ON-RRPs dwindling to close to zero, except at the quarter-end in June. But note that even the quarter-end spike is small relative to volumes of $500 or $600 billion that have occurred in the past. 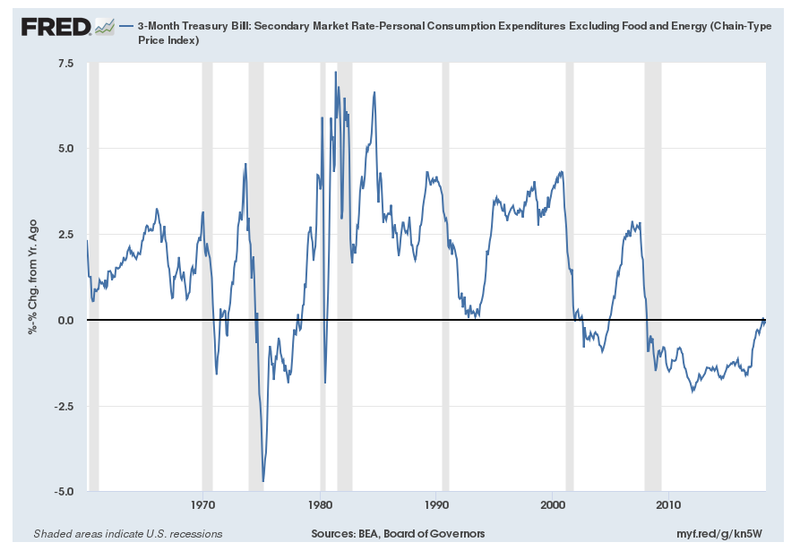 Unfortunately, the Fed seems to have discontinued some ON-RRP time series, or FRED is not carrying them, so I can't show you the historical data. Take my word for it, though. Volume in the ON-RRP facility was typically much higher - on the order of $60 billion to $100 billion daily, and spiking substantially at quarter-ends, before this year. Since liftoff, that has settled in at about $240 billion daily. 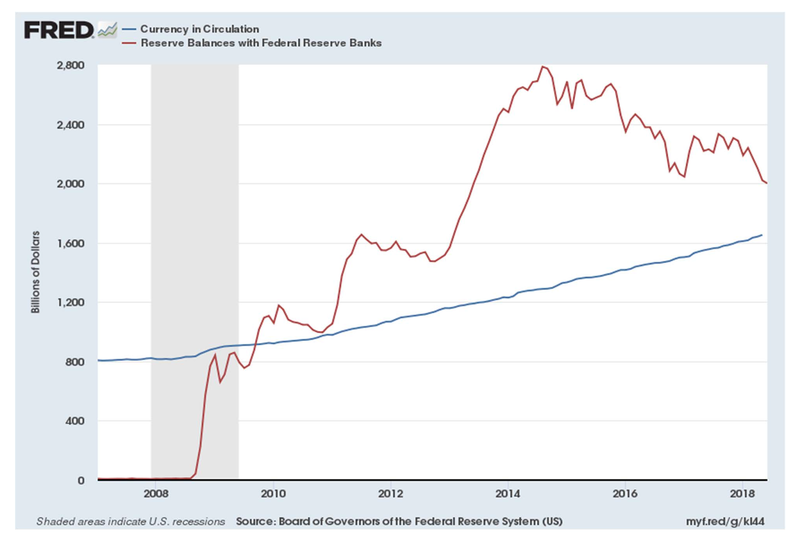 So, though the reinvestment program was holding the size of the balance sheet constant in nominal terms, growth in the nominal stock of currency has been kicking along at a good pace, so that the stock of reserves has been falling. At $2 trillion, this stock is still very large, however. Another interesting feature associated with the Fed's large balance sheet is the post-financial-crisis behavior of the Treasury's General Account with the Fed. The General Account is the Treasury's reserve account with the Fed. This account was carefully managed before the financial crisis, as an increase in reserves held by the Treasury will, everything else held constant, reduce reserves held by the private sector. But, with a large balance sheet, even large movements in Treasury reserve balances are of essentially no consequence. So, the balance in the General Account has been much larger, and very volatile. For some reason the average balance in the account has increased since liftoff, with the balance at a substantial $374 billion on June 27. This shows the fed funds rate, a repo rate, and the FOMC's target range for the fed funds rate from liftoff to early April. This shows how the margin between the fed funds rate and IOER (at the top of the band) has shrunk, and how the repo rate, which used to trade close to the ON-RRP rate (at the bottom of the band) began tracking the fed funds rate and IOER after the March FOMC meeting. 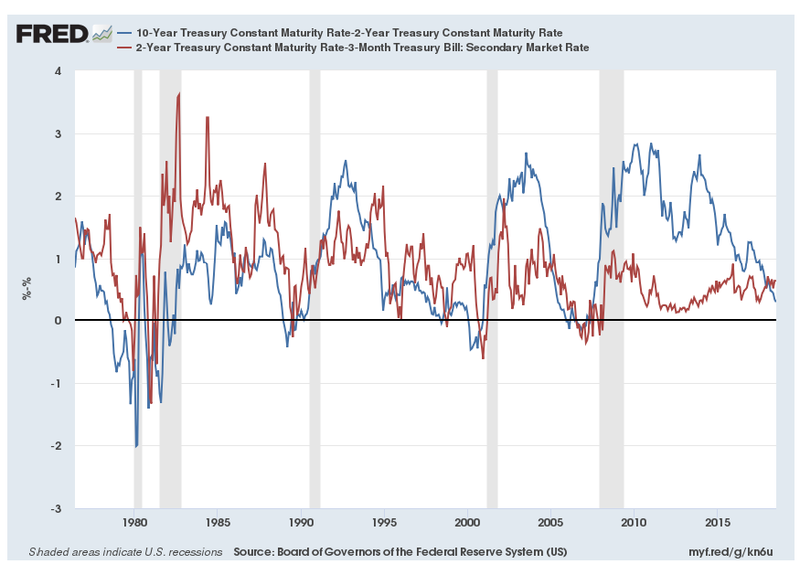 As you can see, there used to be a substantial margin between the fed funds rate and the one-month T-bill rate, but that essentially went away after the March FOMC meeting. It's clear that all overnight interest rates have tightened up. What was once a floor-with-subfloor, a leaky floor, or whatever, is now behaving like a floor system should, with IOER tying down overnight interest rates. And the ON-RRP rate, at 20 basis points below IOER now, is not attractive to overnight lenders. The ON-RRP program could now be discontinued, and it would make no difference. Why is this happening? Well, you don't have to think too hard to figure that out. The tightening up of the overnight market coincides with the phasing-out of the Fed's reinvestment program. From the very first chart, you wouldn't think that would make much difference, if you thought that what is important about the big balance sheet is only its size. 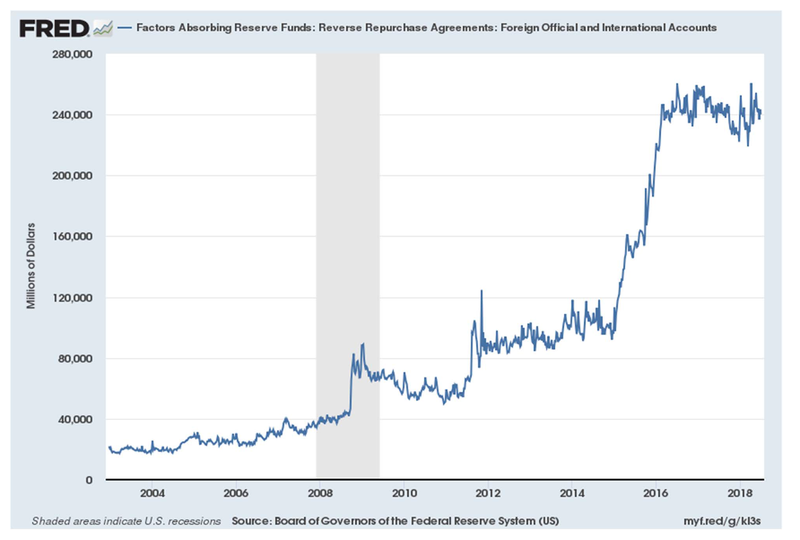 But clearly the flow of asset purchases by the Fed matters, and a cessation of the reinvestment program makes a big difference for this flow, which in turn has a large effect on the stock of on-the-run safe assets - which are the primary fodder for the overnight repo market. Thus, what we have been observing in overnight markets from liftoff until early this year was due to a shortage of collateral. 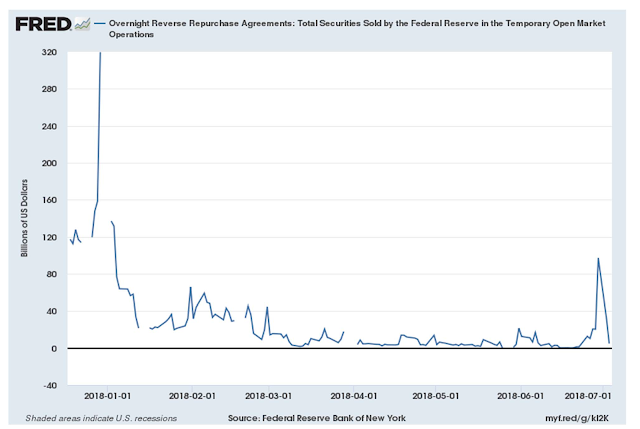 This shortage was keeping the repo rate low relative to IOER, and causing anomalies in the behavior of the fed funds market. 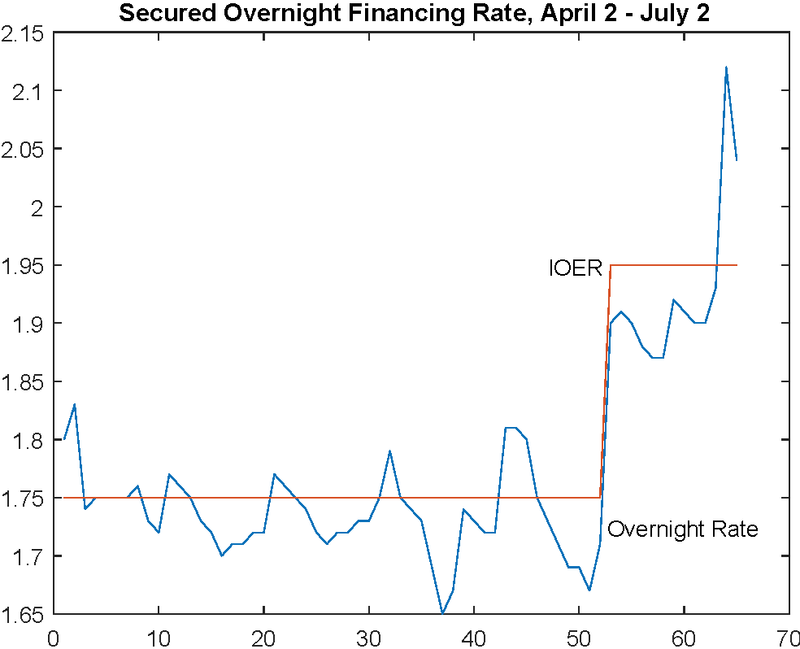 The IOER/fed funds rate margin was not caused primarily by "balance sheet costs," but by lack of good alternatives to the fed funds market for overnight lenders. 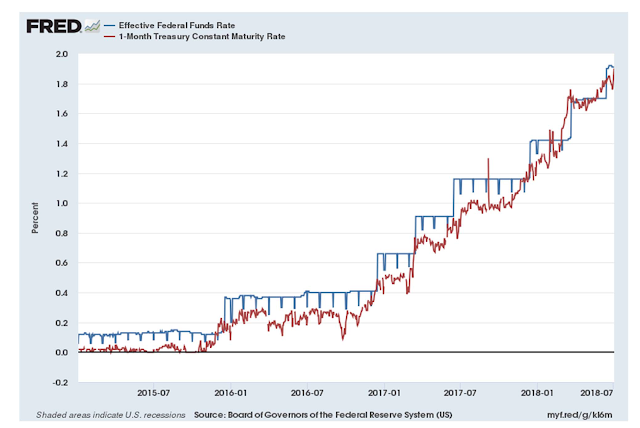 Now that repo rates are close to IOER, the fed funds market has become more competitive. The bottom line is that quantitative easing was messing up overnight markets. A program intended to ease something was just gumming up the financial plumbing. 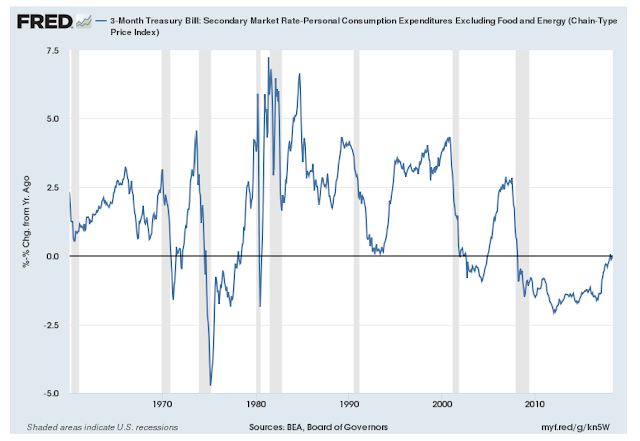 Low real interest rates (or a low neutral rate, as it's sometimes called in the Fed system) was stemming in part from what the Fed was doing to itself. The deputy manager then discussed the possibility of a small technical realignment of the IOER rate relative to the top of the target range for the federal funds rate. Since the target range was established in December 2008, the IOER rate has been set at the top of the target range to help keep the effective federal funds rate within the range. Lately the spread of the IOER rate over the effective federal funds rate had narrowed to only 5 basis points. A technical adjustment of the IOER rate to a level 5 basis points below the top of the target range could keep the effective federal funds rate well within the target range. This could be accomplished by implementing a 20 basis point increase in the IOER rate at a time when the Committee raised the target range for the federal funds rate by 25 basis points. would simplify FOMC communications and emphasize that the IOER rate is a helpful tool for implementing the FOMC’s policy decisions but does not, in itself, convey the stance of policy. The key problem here is that announcing the policy as a target range for the fed funds rate is starting to look silly. The cure for that problem isn't reducing IOER to five basis points below the top of the range. Further, the idea that that IOER does not "convey the stance of policy" is false. That's how a floor system works, and this one now appears to be approaching the point where it's working fine. The FOMC's focus on the fed funds rate as a policy rate has always been questionable, and seems particularly wrongheaded in the large-balance-sheet period. The fed funds rate is unsecured, and so reflects substantial counterparty risk in times of crisis. In pre-crisis times the New York Fed intervened in the repo market (a secured credit market) to target the fed funds rate. That's pretty weird. Why not just target an overnight repo rate, like most other central banks do? Repo rates are safe rates of interest, uncontaminated by risk, and the New York Fed could pretty much nail the target every day through a fixed-rate full-allotment procedure. In the post-crisis period, it got even worse, as trading in the fed funds market consists mostly of arbitrage trading, and the rate doesn't mean what it did pre-crisis. Some people in the Fed system seem wedded to the fed funds rate as a policy rate, but they should give that up and move on. “But it’s possible, to everyone’s surprise,“ he said, that reserves are in fact growing scarce, which would mean ”they’ve reached the point where they will need to stop the run-off." First, no one should be thinking of this as a "scarce reserves" situation. Two trillion dollars of reserves is still a massive quantity of reserves. That's about 11% of annual GDP. I think people are looking at how overnight interest rates are tightening up and thinking that this somehow looks like pre-financial crisis times, which people often call (misleadingly) a regime of "scarce reserves." As I discussed above, what we're seeing isn't a problem of scarce reserves. It's a good thing - the scarcity in safe collateral is going away. Unfortunately, FOMC decision-making is still being driven by the people who decided to implement the Fed's quantitative easing (QE) programs, and bought into those programs in a big way. Like Ben Bernanke, who continues to defend QE, the proponents seem not to have learned much from the episode. This was an experiment, and I think I'm learning that it was a mistake. The Fed could stick with a floor system, protect Bernanke's legacy, and live in denial. There are circumstances in which a large balance sheet could be useful. But not if that means turning good collateral into inferior bank reserves.